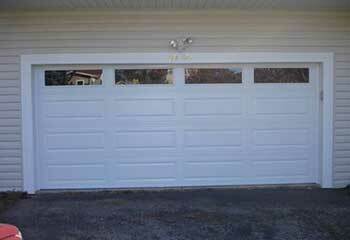 We work on various garage door projects every day and created this page to present the most recent ones for the purpose of helping you get the best solution to your problem. 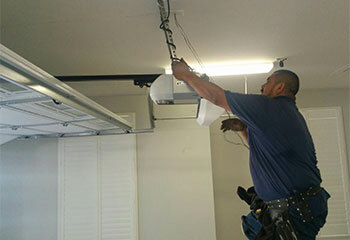 Our company has been providing repair and replacement services for years. Scroll down for more information on our latest projects. Our Solution: We showed this customer a few different door options and he chose to go with a new one from Clopay's Modern Steel collection. We then installed the door for him and made sure he was completely satisfied with it. Our Solution: This customer's son had accidently crashed into their aluminum garage door with his bike, which caused the panels to become severely dented. 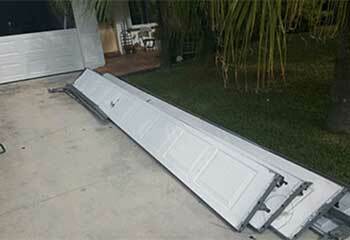 We inspected the damages, and told the customer there was no need to replace the entire door. We removed the damaged panels and installed matching ones in their place. 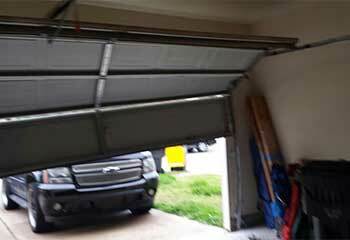 Customer Issue: Garage door off track. Our Solution: Mr. March's door got off track after a minor bump with the car. We aligned the track that got slightly bent, and got the door back on it. Customer Issue: Broken spring replacement. Our Solution: The customer called when he couldn't get the door opened. 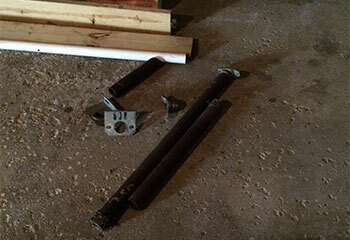 We replaced the broken torsion spring with a new one. Customer Issue: Remote control failure. Our Solution: We replaced the wireless keypad with a brand new copy that works perfectly with his Genie 4042-TKH SilentMax 1200.